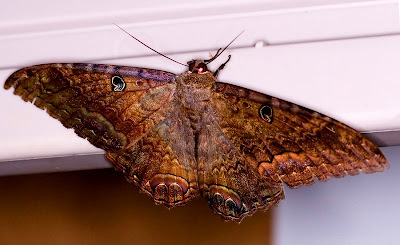 Kitchen and Residential Design: Witch moth or money bat? This is Ascalapha odorata, known in The Bahamas as a bat moth or a money bat. 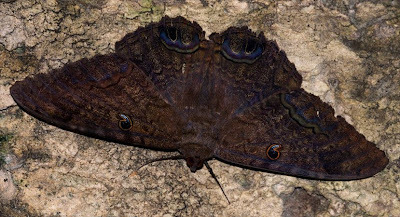 A. odorata is the largest moth in the western hemisphere and it can be found across Mesoamerica, the Caribbean and The Bahamas. Sometimes, they show up in the extreme southern US, though I have never seen one here. A. odorata has a wingspan between six and seven inches, so they are hard to miss. Just about everywhere they're found, they're commonly called such names as witch moth, black witch, death moth and death butterfly. They are considered to be a harbinger of doom and in rural Mexico, getting one in the house portends the death of a member of that household. Pretty macabre stuff to attribute to a harmless moth. Well, in The Bahamas they are everywhere. Inside the house, outside the house, day and night, they are as much a part of life on the Out Islands as land crabs and mosquitoes. In what I take to be a profound commentary on the very essence of Bahamian culture, these moths are treated as a welcome guest. Bahamians call them money bats and having one fly into the house is a very good thing. In fact, having one come in means that you will come into an unexpected windfall. Having one hit you on the face as it comes in is even more lucky. In the last week, I got hit in the face by enough money bats that I ought to be rolling in the dough in a matter of days. For a group of people who have been and continue to be so completely shafted by the world events that swirl around them, I think it speaks volumes about their national character. I went to a self improvement seminar ages ago and the speaker kept urging us to "choose what's so." It didn't make a whole lot of sense to me at the time, but in the years since I've come to see it as a really great thing to practice. If I can't change something about my life or the role I play in it, why not treat that something as if I chose it rather than moaning and wailing about having it forced upon me? If I'm surrounded by black moths with six inch wingspans and I can't do a thing about it, why not welcome them in? Why not indeed? I may be completely out to lunch with this, just another stupid American who's hopelessly out of his element there. And so what if I am? It's a great honor to be granted a peek into the culture and lives of a group of people who are located closer to me than Atlanta is, yet who exist in a world I can barely imagine. Now that's cool. I haven't seen a big moth in years. I like the fact that they find them to be harbingers of good luck rather than getting freaked out like many people here. This has been a particularly fruitful summer for them over there. I stopped counting them on the first day. At any given moment, there were at least three of them inside the cottage and legions flapping against the screen doors to get in. I had one that wouldn't leave me alone at the end of Sept. when visiting my happy place. I have had very good tidings since then! Or maybe I'm just another crazy american!